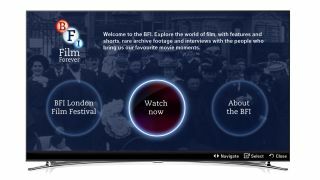 The BFI has told TechRadar that it is looking to launch its BFI Player platform on as many TVs as possible in the near future. Announced this week, the BFI Player is a portal for both archived and new content from the British Film Institute. Offering both paid-for and free content, it is packed with memorable movies but it is, for the moment, for web and tablet only. Ed Humphries, director of digital at the BFI, believed being web only wasn't an issue, noting that "audiences are really comfortable with watching content online". He did explain to TechRadar, though, that alongside the web player it would continue to bolster its smart TV service, which so far consists of an app on Samsung's smart TV platform. "Samsung has been a partner for us for some time," said Humphries, "and our smart TV strategy will always address a portion of the market, so we see TV and web fitting together - they are stepping stones to our content. "We hope to move all of our premium content to smart TV in the near future, with Samsung being key to this as a partner."